CyberKnights Facebook Page hits 1,000 Likes! Thank you to all our 1,000 Facebook fans that liked our FIRST Team 195: The CyberKnights page! Tell a friend and follow the team as we begin the 2017 competition season on March 4th and 5th in Waterbury, CT. Build steam pressure. Robots collect fuel (balls) and score it in their boiler via high and low efficiency goals. Boilers turn fuel into steam pressure which is stored in the steam tank on their airship – but it takes more fuel in the low efficiency goal to build steam than the high efficiency goal. Start rotors. Robots deliver gears to pilots on their airship for installation. Once the gear train is complete, they turn the crank to start the rotor. Prepare for flight. Robots must latch on to their airship before launch (the end of the match) by ascending their ropes to signal that they’re ready for takeoff. During the remaining 2 minutes and 15 seconds of the match, the teleoperated period, student drivers control robots. Teams on an alliance work together to build as much pressure and start as many rotors as possible – but they have to be sure they leave enough time to latch on to their airship before the end of the match. Points for these efforts are awarded as shown in Table 2-2. Alliances are seeded in the Qualification tournament using ranking points which are awarded based on a combination of their Win-Loss-Tie record (2 points for a win, 1 point for a tie), the number of times they reach a 40 kiloPascal (kPa) pressure threshold (1 point), and the number of times they start all rotors (1 point). 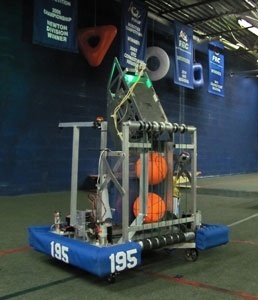 The Cyber Knights, also known as FIRST Team 195, is a robotics team from Southington High School in Southington, CT. The team has actively participated in regional and championship competitions since their first season in 1998. The FIRST Robotics Competition challenges teams of young people and their mentors to solve a common problem in a six-week time frame using a standard “kit of parts” and a common set of rules. Teams design, build, and program robots and enter them in a series of competitions designed by Dean Kamen, Dr. Woodie Flowers, and a committee of engineers and other professionals. Our team brings a unique experience and different way of involving students. Rather than just playing with robots in an after school club, these students will be working in a true engineering and business environment alongside professionals. Our team is one of nearly 2000 FIRST robotics teams around the world. Our program is open to all students. Due to budgets being very slim, we rely exclusively on company and community sponsors to keep our program running. Some of the world’s most respected companies provide: funding, mentor-ship, time, talent, and equipment to make FIRST’s mission a reality. There are over 45,000 committed and effective volunteers who are vital to introducing 100,000 youths to the joy of problem solving through engineering. Since 1992, the FIRST Robotics Competition (FRC) has challenged high school students working with professional mentors to solve an engineering design problem in an intense and competitive way. Not only is the program is a life-changing, career molding experience; it’s also a lot of fun! In 2006, the competition reached more than 28,000 students on 1,133 teams in 33 regional competitions and one Championship event. Not only are there hundreds of teams in the United States, there are also teams that come from Brazil, Canada, Ecuador, Israel, Mexico, and the United Kingdom. FIRST provides high schools students with the ability to put their education to use in the real world. They apply their skills throughout each season to better themselves, minds, and life. FIRST offers over $14.8 million in scholarship funding that allows students such as from FIRST Team 195 to attend colleges such as Cornell University, Rochester Institute of Technology, and Rensselaer Polytechnic Institute. FIRST not only inspires the teachings of science, engineering, and technology, but as well as essential life skills and values. FIRST is prominent in expressing the thoughts and values of coopertition as well as Gracious Professionalism. Coopertition is achieved by encouraging not only yourself, but other teams to work together for a greater cause. Coopertition emphasizes high-quality work while maintaining a strong relationship with others even when in the face of fierce competition. Teams should always treat others with the utmost respect, promote learning, and encourage great working relationships. Likewise, Gracious Professionalism emphatically enforces good sportsmanship. Teams should always be seeking a way to maintain their integrity through the use of Gracious Professionalism. This means not gloating over a victory, or an award, but representing your achievement as an effort for all of FIRST. In an average year: the robots, materials, equipment, competition entry fees, travel expenses, and more will amount to thousands of dollars. Without some form of funding, it would be impossible to sustain an FRC team. Team 195 relies exclusively on donations and grants from local businesses and organizations to sustain our program. Without our sponsors generosity and support, our team simply would not exist. How can you sponsor the CyberKnights? If you are interested in becoming a sponsor or learning more about FIRST or Team 195, you can contact us here. Additionally, you can print out this form and mail it in. We are a non-profit organization and accept donations of any amount. All donations are tax deductible. We are hoping you will consider supporting this awesome program while promoting your business. Additionally, we will be happy to come to your place of business, make a presentation, and tell you all about our team along with one of our robots. · Along with the above benefits sponsors are able to establish strong relationships with their future workforce. · Many of our sponsors have added to their workforce by hiring 195 Alumni as interns and long-term employees. To receive a copy of the sponsorship form, click here. Knight Fury is the robot for the CyberKnight’s 2016 FRC season. Breaking down defenses all the way to the Einstein Field itself, Knight Fury features a CAN bus system for reliable connections to all motor controllers, a two speed Andymark sonic shifter gearbox, rhino treads, and auto-alignment systems. This all translates to a robot with a two ball autonomous, a fast and reliable climber, a consistent catapult and the capability of crossing almost any defense. Knight Fury was designed to shoot from virtually anywhere inside the opponent’s tower zone, whether it be from the far corner or at the tower itself. Four CIM motors, each attached with a sensor, provided the robot with unprecedented speed, agility, as well as self-adjustment. drive motors and am-700 encoder steer motors. We designed OSCAR to have a stacker that is capable of lifting 6 totes with two degrees of freedom. These totes are stood in place by a pneumatic clamp and pneumatic stabilizer that apply a force of about 200 pounds. The robot also features a tethered ramp for ease of standing. The F-195 KnightHawk is Team 195’s robot for the 2014 FRC Game “Aerial Assist”. This robot features a 6-CIM motor drivetrain that powers 4 of the 6 wheels. We use 4” Hi-Grip wheels in the middle and rear with 4” Omni-wheels in the front for additional turning speed. The F-195 KnightHawk has a unique intake considering it can quickly grab a ball that is in front of the robot or to either side. Additionally, the intake can move up and down, allowing the robot to grab balls that are bouncing across the field by clamping on them. We use surgical tubing mounted on PVC pipes to grip the ball and center it in front of the launching mechanism. Our launching system consists of an aluminum plunger on a steel box-channel that is propelled into the ball by surgical tubing. We are able to retract the plunger to different spots to allow for variability in the force from the plunger on the ball. To give our robot variable shooting angles, the entire body can move to pre-defined heights. The body moves on a rack which is assisted by surgical tubing. Finally, the F-195 KnightHawk features vision processing. We can track hot-goals in autonomous with a wide-angle camera and two led panels mounted on an angle to reach both goals simultaneously. 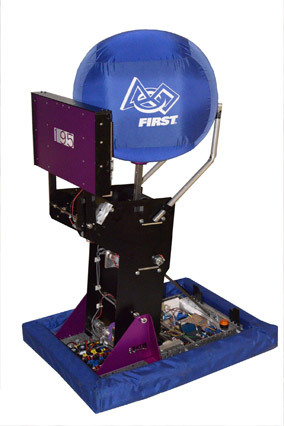 With a 12 inch polyurethane and aluminum shooter wheel, full-court and close range accurate shooting capabilities, 4 wheel drive, an elevating shooter table and a quick-load system, the Cyber Knights’ 2013 robot, OddJob, can make it rain. Controlled by an extremely stable PID loop and carried by the momentum of its gargantuan size, our wheel and shooter assembly can fire frisbees full court with precision. Most teams choose pneumatic wheels or small rollers to shoot their frisbees. However, with the momentum and power generated by our wheel it can fire up to 4 frisbees within 2-3 seconds while losing only 100-200 rpm. This powerful shooter not only maintains consistency, but allows for OddJob to fire frisbees over 30 yards. The “Whale Tale” frisbee loading system allows for quick access, loading, and easy alignment to the feeder station. This gives OddJob the ability to rain frisbees across the field at an extremely fast rate. Combined with a camera for vision targeting, a powerful shooter assembly, and easy-loading system, OddJob can outscore the competition. Our climber is quick and efficient. Locking into place on the 10 point tier, OddJob doesn’t need to climb any higher to exceed scores of over 150. When the volunteers empty the overflowing 3-point goal, frisbees rain down onto the floor. 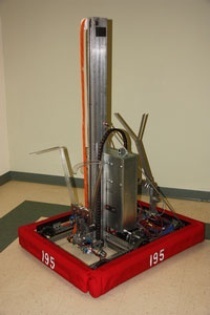 Oddjob made it rain in the competition in Connecticut and did the same in St. Louis all the way to the semi-finals of the Newton Division. 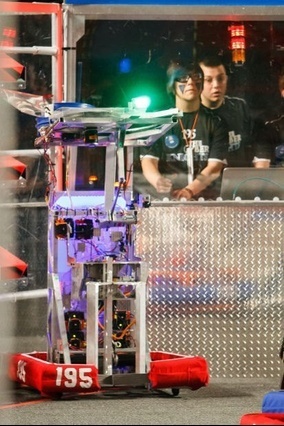 Featuring four independently controlled swerve modules, a simple and efficient intake and collection assembly, a three-stage “Linear Accelerator” shooter and a bi-directional bridge actuation arm, the Cyber Knights’ 2012 robot, the Screaming Knight, has proven to be a fierce competitor. Our drivetrain consists of four independently controlled swerve modules, each of which is controlled by two PID control loops. The first control loop uses feedback from our drive encoders (one on each module) to ensure that all four wheels are spinning at exactly the same rate. The second control loop uses feedback from our potentiometers (one on each module) to ensure that all four swerve modules have been set to the correct angle. In one drive mode (standard Arcade drive) the modules are all set to different angles so that the robot will turn on a radius. In another drive mode the wheels are all angled in the direction the joystick points in, allowing the robot to translate in any direction. In yet another drive mode, the wheels are all turned perpendicular to the center of the robot, allowing the robot to precisely rotate about its central axis. This incredible control over our drive system, combined with four skid plates for crossing the central barrier, allows the robot to compete with an unparalleled level of speed, maneuverability, and flexibility. Our intake and collection system has proven to be simple yet effective. Its width ensures that our robot can pick up balls quickly and with ease, delivering the balls to the shooter in about a second. Additionally, an infared sensor mounted at the top of the intake system is used to control the flow of balls into the shooter during the Hybrid period of the game. The three-stage “Linear Accelerator” shooter is the primary feature on this year’s robot. While most teams have elected to use a single wheel or roller to accelerate the balls, our robot uses three separate rollers arranged on an angle to gradually accelerate the game piece through the robot. The lowest roller spins slower than the middle roller, which itself spins slower than the final roller. This gradual acceleration greatly increases consistency and helps mitigate ball density issues. Our bridge actuation arm has proven to be consistent and reliable, able to effectively tip the bridge to the floor both from the front and back of our robot. This affords our drivers a great deal of flexibility both in aqcuiring balls from the bridge and positioning themselves for the end-game. The Screaming Knight has proven to be very successful, finishing in the finals at the 2012 NYC regional and winning the 2012 CT regional after seeding 4th. It also received the Industrial Design Award (NYC) and the Excellence in Engineering Award (CT). The Knightmare 2k11 is the robot that the Cyber Knights designed for the 2011 FRC game LogoMotion. Its primary features are a two-part elevator and a pivoting gripper that grabs tubes from the inside. Fully extended, the robot can reach just under 130 inches. The elevator can move from the floor to its maximum height in about 1.5 seconds. As a result, it is able to score quickly on any scoring peg. The gripper and pivot can pick up a tube from the floor in just under a second, and likewise can place a tube on a scoring peg in around a second. The drive system affords a great deal of speed and maneuverability. It features two treaded wheels in the center driven directly by the transmissions, and then four omni wheels, two on each end of the robot, allow the robot to turn more easily. The center treaded wheels have been dropped a fraction of an inch in order to increase the amount of weight resting on those wheels and, subsequently, increase their traction. This gives the robot greater control ability and power while maintaining speed and stability. In addition, advanced programming has greatly increased our robot’s efficiency. Picking up and scoring a tube requires only one button to be pressed, and the elevator moves automatically to one of the pre-programmed peg heights with the press of a button. These pre-programmed actions are carried out more quickly and efficiently than any human could, allowing the robot to score more tubes in a match than most other competitors. On that note, our autonomous program operates with unparalleled efficiency and consistency – at the CT regional it successfully hung the ubertube in every single match (16 out of 16 times!) However, that is only one robot. The mini-bot is able to climb the pole in about 1.1 seconds. The mini-bot deployment system features a pivoting arm that drops down from the back of the robot. The arm hovers a few inches above the base of the tower. At exactly 10 seconds remaining the arm is dropped all the way down so that a mechanical latch releases the mini-bot. The mini-bot travels along this arm and hits the pole in a fraction of a second, at which point it begins climbing the pole. The CyberKnights debut their new robot in week one of FIRST STEAMWORKSS, the 2017 FIRST Robotics Competition game. New York’s Tech Valley region will once again be home to premier a FRC event, located on the Rensselaer Polytechnic Institute campus in the state-of-the-art East Campus Athletic Village Arena (ECAV). 36 teams, including competitors from Québec, Turkey, India, Connecticut, New York and South Carolina will gather to compete in another exciting year of high-tech competition! The CyberKnights continue their 2017 season in Hartford. The CyberKnights compete against the best in New England at the University of New Hampshire. The CyberKnights hope to qualify for the world championship in Saint Louis. Team 195’s Community Involvement Team 195’s personal mission statement is “to bring the celebration of science and technology to the forefront of our community.” Chasing this goal, we ride a FIRST Robotics float in our annual Apple Harvest Parade and hosted our own District Event in 2014, where people from all walks of life came to experience the brilliance of engineering. In 2014, the CyberKnights found out that our county’s SWAT robot was broken. Of course, the CyberKnights were proud to help our boys in blue- we machined new mounting brackets, installed AV equipment, and fixed their programming, successfully putting their robot back in action. 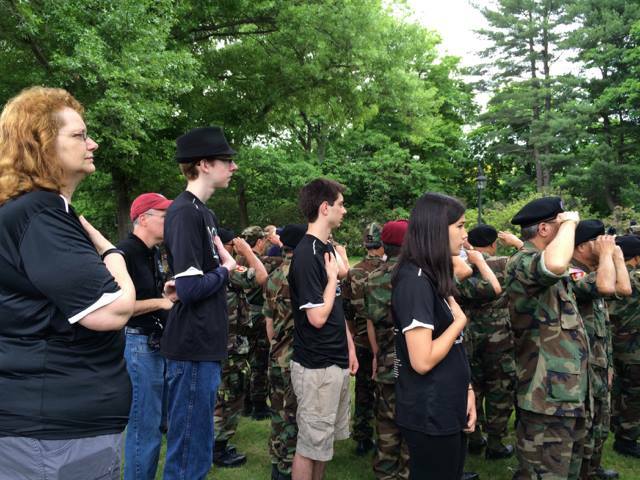 The CyberKnights latest mission is to “serve those who served first,” our veterans. Without the freedoms that our veterans blessed us with, we could not chase our dreams. To express our appreciation for their sacrifice, we write hundreds of Christmas letters to service members, visit over 90 elderly veterans in several care facilities, serve as waiters at an annual veteran’s appreciation dinner, and participated in a veterans clothing drive. In 2014, we raised over $250 for support of the Wounded Warrior project and collaborated with the Fisher House to raise more funds for wounded veterans. We have also sent care packages to soldiers in Afghanistan, collected bottles for an Eagle Scout to build a veteran’s memorial garden, and maintained veteran’s gravestones in our community. Most recently, we have embarked on our most ambitious veteran’s project yet: building a national monument recognizing the Laotian soldiers who sacrificed their lives to save Americans during the Vietnam War.